Lesser Spotted Woodpecker numbers have declined considerably here in recent years, and this bird is now on the UK red list. The reasons for this decline are not fully understood, but RSPB research has suggested that the birds have not been breeding successfully but it is not clear whether this is a widespread problem. In the last few years since the completion of the RSPB project very few lesser spotted woodpecker nests have been reported and monitored. However, two conservationists, Ken and Linda Smith, are now aiming to help bird watchers rectify this. With over 30 years experience of monitoring woodpecker nests they are hoping to build up a clearer picture of where the birds are and how well they are breeding. They began their research in 2015, and so far have been able to follow 10 nests each year, finding out whether the woodpeckers are successfully raising their young. In 2017 they hope to be able to study more. This is where birders can help. 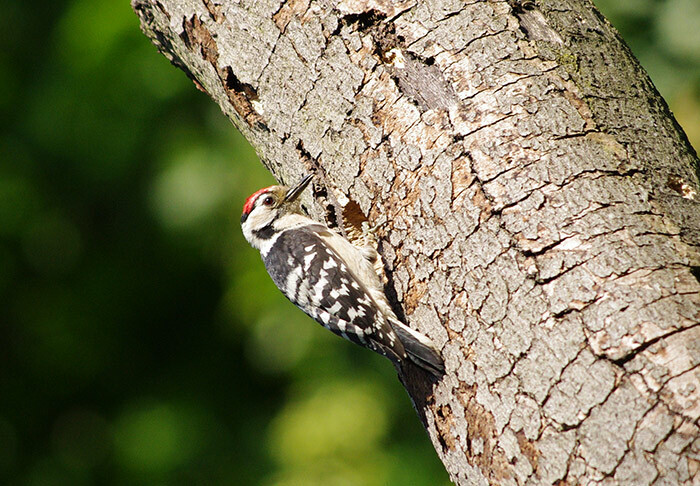 If you discover any lesser spotted woodpecker nest sites, please contact Ken so that he can arrange to visit. Now is the time to look and listen out for these birds. In February and March, Lesser Spotted Woodpecker activity is usually more obvious, with the birds calling and drumming to declare their territories. Nesting begins in April. Data on breeding sites and nests will be treated in strict confidence. It will only be passed on to the BTO and RSPB, who are supportive of this project.